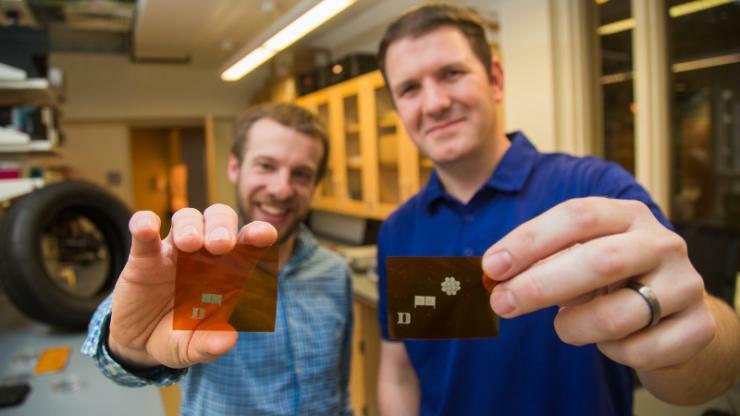 Since the technology was originally reported in IEEE Sensors Journal in June 2017, Franklin has been working to commercialize it with colleagues in Duke’s Nicholas School of the Environment led by Jesko von Windheim, associate dean of innovation and entrepreneurship. Professor Aaron Franklin and Joseph Andrews, a PhD student who led the original research on the tread wear sensor, demonstrate where the new sensor would be mounted in a commercial tire. While most of this electric field passes directly between the two electrodes, some of the field arcs between them. When a material is placed on top of the electrodes, it interferes with this so-called “fringing field.” By measuring this interference through the electrical response of the grounded electrode, it is possible to determine the thickness of the material covering the sensor. Franklin and his colleagues have spent the past six months optimizing their original design and showing that it is sensitive enough to work with the thick treads of semi-trailer truck tires. They have shown that using carbon nanotubes (tiny cylinders of carbon atoms just one-billionth of a meter in diameter) allows the sensor to track millimeter-scale changes in tread depth with high accuracy and sensitivity. The sensors could easily signal when it’s time to replace tires or report information about uneven and often dangerous tire wear.